Cowboys owner Jerry Jones is still lamenting the Eagles’ success, but offered a surprising admission: He actually rooted for the Birds during the Super Bowl. Last we heard, Cowboys owner Jerry Jones was so upset over the Eagles' success last season he was screaming into his pillow, an understandable reaction considering it's been 22 years since Dallas last won a Super Bowl. But in a recent sit down with reporters at the NFL combine, Jones made a surprising admission: He actually rooted for the Eagles during the Super Bowl. "As much as we have the rivalry that we have, and as frustrating as it was for the Cowboys not to be playing, as much as all of that, I was proud of them, given that narrow set of circumstances, could root for them," Jones said Saturday in Indianapolis. "That takes it right down to just absolutely no choice, you either do or you die. And I want to go again." Still, that it was not the Cowboys up against the Patriots seemed to hurt. "We got some comparables to where they are, so then why not us? What's wrong with us," he said. So why was Jones inclined to root for the Eagles? Maybe it was due to Patriots owner Robert Kraft's insistence during a contentious conference call in November that Jones drop his fight with NFL commissioner Roger Goodell over a new contract, after Goodell upheld running back Ezekiel Elliott's six-game suspension. According to ESPN, Jones later told Goodell he was planning to go after him with everything he had. Of course, Goodell ultimately won what many referred to as a "civil war" among NFL owners, earning a new five-year contract. On Monday, Goodell and Jones met for an hour over a dispute about $2 million in legal fees incurred by league owners the NFL commission has ordered Jones to repay. Regardless, Jones said the Eagles' Super Bowl win has raised the bar for the Cowboys, who entered last season with high hopes but ended up faltering due to Elliott's suspension and quarterback Dak Prescott's sophomore slump. "I think it raises the bar. I think it puts pressure on the Cowboys," Jones said. "They've took it down to the bone and brought it back up and have a world championship and we've been doing the same thing, where is ours? That's fair. That's fair." Jones even offered Eagles owner Jeffrey Lurie a backhanded compliment by taking a shot at himself, saying Philadelphia has a "better owner" than the Cowboys at the moment. 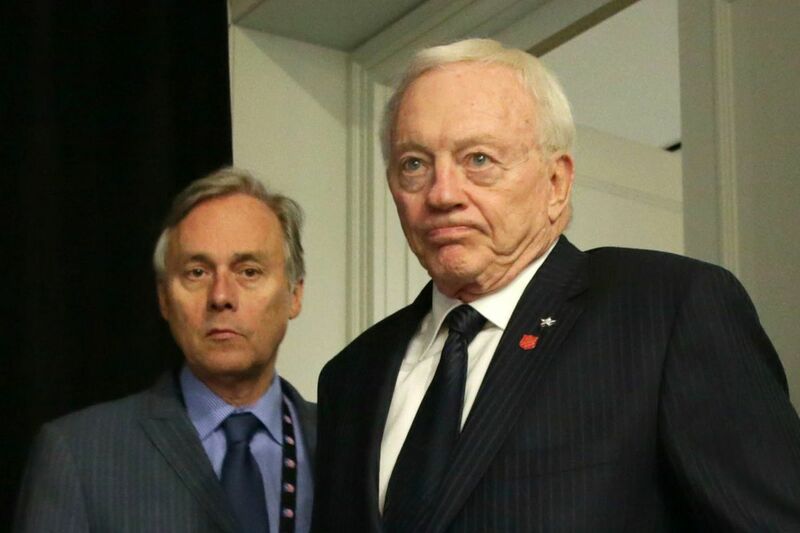 "Not as good a general manager but better owner," joked Jones, who also acts as the Cowboys' general manager.